Every self-respecting fan of robots, or even animations featuring robots, has at some point dreamed of strapping themselves into an exoskeleton and emulating their favorite anime heroes. 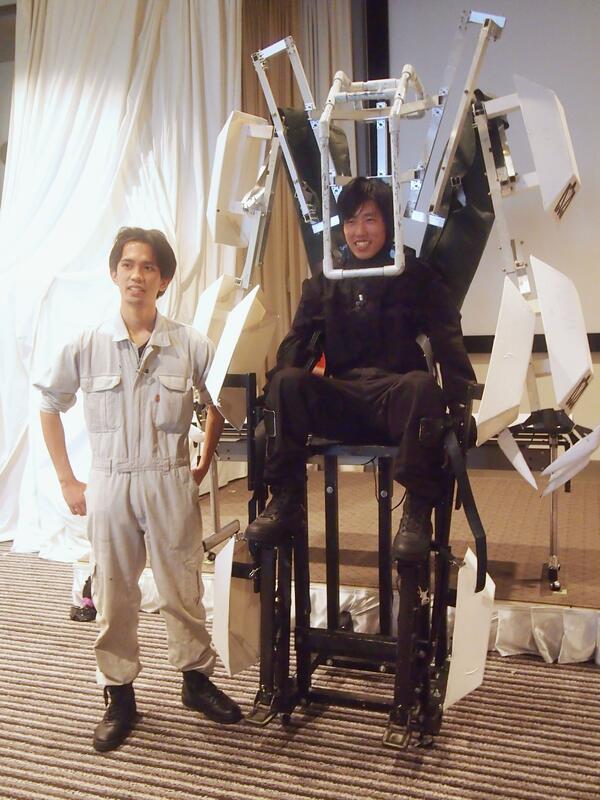 The Skeletonics robot suit, developed by 24-year-old Reyes Tatsuru Shiroku and other members of the 2008 Robocon robot contest champion team from Okinawa National College of Technology, may soon make that dream a reality. Operating the 2.6-meter-tall Skeletonics contraption is as simple as climbing into its metal frame and moving your own arms and legs. But it’s hardly the most practical design. Requiring no electricity, it also offers no boost to the wearer’s strength or speed, and isn’t likely to become a feature of nursing care or disaster relief efforts anytime soon. “We didn’t think about creating anything useful. That’s probably why we were able to develop a unique thing,” Shiroku said. Skeletonics has attracted a huge crowd at every event it has featured in. During a science show at the TEPIA Advanced Technology Exhibition Hall in Tokyo’s Minato Ward, which took place in August, 25-year-old Skeletonics developer Tomohiro Aka drew coos and cheers from a crowd of watching children by performing gymnastic exercises in the suit. Aka said the performance made him feel “like a giant,” but admitted that carrying and operating a 30- to 40-kilogram exoskeleton had quickly left him feeling exhausted. The team completed the first model of Skeletonics in February 2011 and posted video clips on the Internet, which soon became popular. 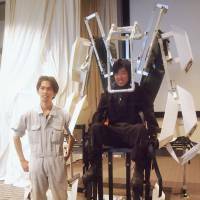 They later received invitations from event organizers to exhibit the exoskeleton, as well as requests for cooperation in technological development projects. Last year, the members founded a company dubbed Skeletonics Inc. in Hachioji, western Tokyo, and began selling the suit — with a price tag of ¥5 million. Huis Ten Bosch, the Dutch -style resort and theme park in Sasebo, Nagasaki Prefecture, purchased one of the models the following year, and has featured it prominently in its parades. “While promoting the use in the area of entertainment, we hope to convey the enjoyment of making things,” Shiroku said. The company completed the fifth-generation Skeletonics model in June.